Portrait of Dickens in his study, William Powell Frith, 1859, Victoria and Albert Museum. In Bleak House Nemo’s desk is ‘a wilderness marked with a rain of ink’, the dirty desk a metaphor for the disorder brought about by the nameless character’s death . 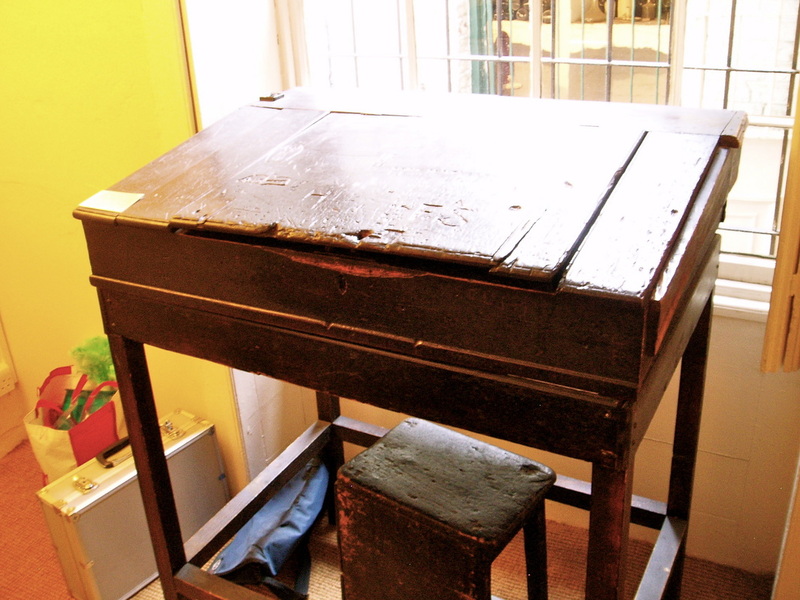 Nicholas Nickleby’s schoolroom offers ‘a couple of long, old rickety desks, cut and notched, and inked and damaged, in every possible way’ much like the schoomaster Squeers and his wife . And in Little Dorrit ‘a dainty little shining desk which looked in itself like a sweetmeat’ houses the ‘little gifts’ that Mr. Dorrit purchases from—and for—a ‘little lady’ . Desks in Dickens’s novels move between material object, character metaphor, and metonym for intertwining social and economic networks. They help us to picture the spaces that characters occupy and to understand the attitudes and exchanges that the novels critique. Exhibitions about the life of Dickens display the desks where the writer created these works to visualise the writing process and to provide material evidence of the writer’s life. Desks are given particular weight in installations about the lives of writers as they offer perspective on the otherwise mysterious process of creation. For the Museum of London and the Charles Dickens Museum these desks illuminate biographical information and bolster attendant exhibition materials. The recent Dickens exhibition at the Museum of London positions at its entrance a portrait of the author at his desk in his London home Tavistock House. The desk is conduit between the man and the books that Frith piles around him. Also on display is Dickens’s desk from his home in Gad’s Hill where he wrote Great Expectations and Our Mutual Friend. Unlike the crowded desk in Frith’s painting this one is empty, set alone on a raised platform, and strategically spotlighted. We are asked to imagine the room in which Dickens wrote, the position of the desk, the placement of objects upon it. The exhibit provides us with the desk but allows us to project upon it our own interpretation of Dickens’s writing life. 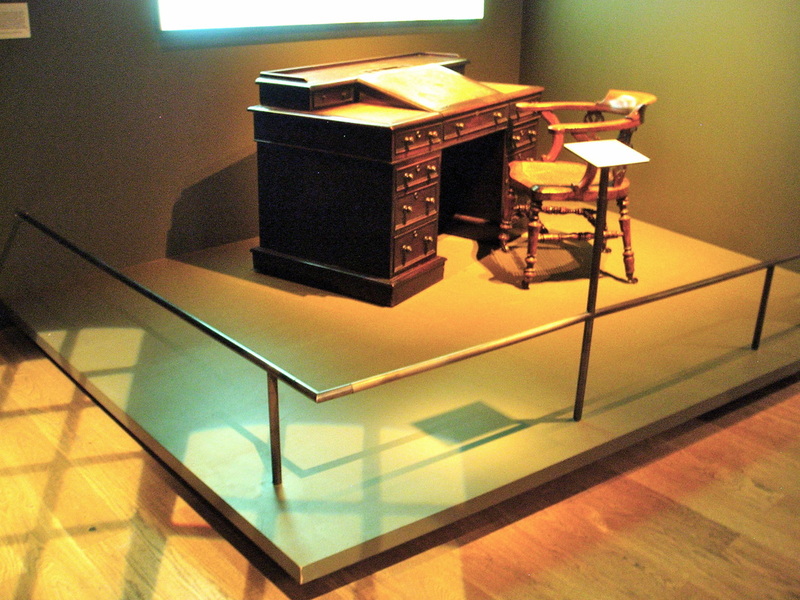 Dickens’s desk from Gad’s Hill on display in the Museum of London’s Dickens & London exhibition. 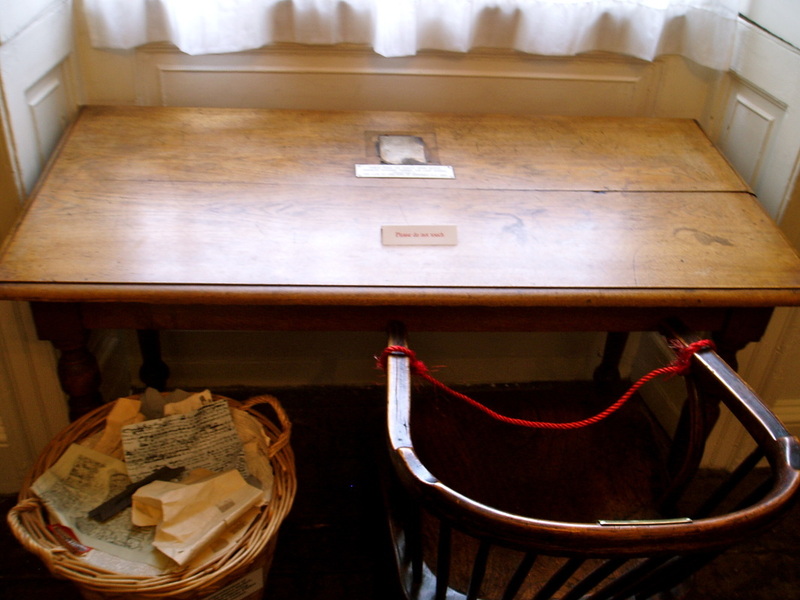 The Charles Dickens Museum features the desk where Dickens worked in the study of his Doughty St. house. Above it, a window looks onto neighbouring rooftops and down into the private garden. The placement provides us with what we are to assume was Dickens’s view as he sat at the desk. We see not only the space where he worked but the sights that might have inspired him. Dickens’s desk in the study of his Doughty St. house, now the Charles Dickens Museum. A room and a desk with a view. The Charles Dickens Museum also has a desk that links to Dickens’s work as a Gray’s Inn law clerk. Unlike the smooth surfaces of the other desks this one is decorated with initials and drawings, markings that bring together those who once worked at this desk and the viewer who now tries to decipher them. The desk reminds us that before Dickens made his mark on the world with his writings, he marked out time with the type of monotonous labour he would come to satirize. But from that labour he gathered material to tell multiple stories—like the ‘cut and notched, and inked and damaged’ desk where he once dreamed. Drawings on the desktop of a Gray’s Inn clerk. Charles Dickens, Bleak House (London: Penguin, 1994), p. 96. Charles Dickens, Nicholas Nickleby (Oxford: Oxford University Press, 1990), p. 67. Charles Dickens, Little Dorrit (London: Penguin, 2003), p. 606.